Ideally located,Very peaceful,Recent construction,In the heart of Makarska Riviera.. near Nature Park Biokovo ,(just drive 10 minutes). You can easily visit Dubrovnik(140 km), or Split (60km) and Trogir (75km) all under protection of UNESCO. Also you can visit beautiful islands Hvar,Brac and Korcula, by yourself or take some boat trips. There are also nice to visit waterfalls of Krka and Plitvice lakes(125-250km by motorway) as well as other well known places. We are two couples from the U.S. this was our first trip to Croatia. We didn’t want to stay in a big city. This was our spot!!!! Upon our arrival, Our host was there to meet us. The apartment had everything that we needed. We didn’t spend much time in the house as the deck and view were amazing. It is a short walk down the hill to the boardwalk that had restaurants, bars, stores and the beach. It is a piece of heaven. You won’t be disappointed . "Our first trip to Podgora was unforgettable, enjoyable and without worries! My husband, son, daughter – in - law, 3-year old grandson and I had no worries with planning our trip, in the most part thanks to the hostess Alida. Very quickly we made the booking of apartments; Alida answered all our questions and our request. At our request, Alida kindly provided us a baby cot, described the route to her home in detail, which helped us get to the place easy. Most of all we enjoyed meeting Alida’s family who by their kind and friendly attitude made our stay a joy! Apartment is nice with fantastic views of the sea, mountains and the islands, that you can see from two balconies of rooms. It was great to sit and see wonderful sunsets here. The apartment has everything you need for comfortable stay and even more – it’s well equipped in the kitchen and in two bathrooms. Living room and both bedrooms are spacious and comfortable and well furnished. TV and internet work fine. There is a parking space too. The seashore with a pebble beach is clean and is within a walking distance of 1-3 minutes. Shops, restaurants, bars in 10 minutes walking. We liked Podgora for the clean sea, beautiful nature and very quiet and nice atmosphere very much! Highly recommend this place for all who love quiet holydays! Thanks a lot, we are happy that you enyojed your stay at our apartment. We all really enjoyed our stay in this apartment which has marvellous views of the sea, the islands and mountains from the main room and two balconies. We ate all our meals here - and having a glass of wine while the sun was setting was a lovelyexperience. You do see some wonderful sunsets here. It is very well equipped in the kitchen, and the bathrooms and bedrooms are furnished to a high quality. A nice place to dry clothes outside the front door was an added bonus. We appreciated having two bathrooms. There is a lovely atmosphere in the apartment and it was beautifully quiet at night. The hosts were very welcoming - thanks for all your help and hospitality, Alida and Stanislav - and booking the apartment was clear and easy. Always quick responses to emails, which was helpful. There was a place to park the car within the grounds of the apartments. Good value for the qulaity of the place and the experience you have there. We liked Podgora for the fine beaches and clear warm sea, the shade on beaches too in the hot July sun, and the ease of buying food in the friendly shops, and the part near the harbour is attractive. We also liked it for not being rowdy or drunken in the evenings - the entertainment at hotel restaurants and bars that we saw is quite old-fashioned and innocent! We ate an excellent meal in one of the restaurants by the harbour. We took a boat trip to Brac and Hvar from Podgora that was a pleasant success. Stronly recommend staying here, especially in this apartment. 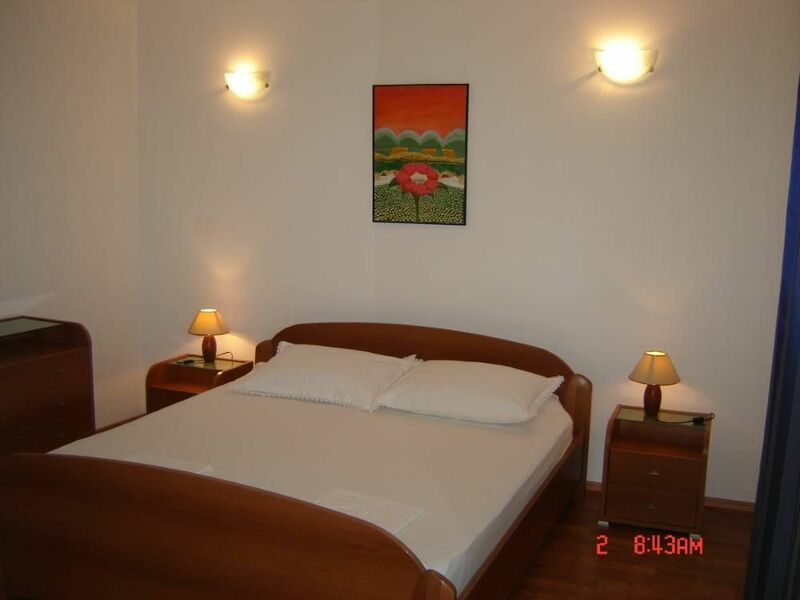 "Lovely, big apartment, clean, quiet, well aquipped with a beautifull see view. It is very close to the beach ond Podgora center. We enjoyed our stay and we would recommend this apartment to everyone." "We spent a lovely holiday in Podgora in July 2012. The holiday house was very spacefull, bright, clean and nice also well equiped. The view from the balcony was great - the lovely turquoise see and the mountains. The beach and all the services were very close and well available and the surroundings was nice and calm - just a perfect place for holiday and relaxing. We really recommend this place for a holiday!" We are a family of 4 - our children aged 10 and 12. The apartment was in pristine condition, very tastefully decorated with two fantastic balconies overlooking the beach and bay of Podgora. The apartment was very spacious with aircondition, which is great considering the very warm nights at Podgora. We enjoyed our breakfast on the balcony every morning overlooking the crystal clear waters of the enchanting bay of Podgora. The apartment has all modern appliances: dishwasher, washing machine, 50 inch television, internet, two nice bedrooms and a huge dining room. The private parking on the premises safely behind gates is nice and comforting when your are in your own car to Podgora. The beach in Podgora is great with the apartment being only 2 minutes walk way. At the beach promenade you find lots of nice restaurants, pizzaria, ice cream shops (a must in the summer), ATM machine etc. We found, that even though there a many tourist in Podgora it has maintained its charme, is kept very clean (both the village and the beach) and everyone seemed very friendly. Credit cards is not for much use though as cash is the only currency that counts in the shops and restaurants. However great the beach at Podgora is, we also enjoyed to look for a secluded beach - which we found some 10 kilometers south of Podgora. Crystal clear waters as you see them on photoshopped pictures in brochures from travel agents - but this is the real deal. Our host (and owner of the apartment) - Mr. Stanislav Lampic - is the nicest man you will ever meet in Croatia (or anywhere else for that matter). We have been traveling all over the world and have never met a more pleasant landlord - we were treated like a returning daughter, son and grandkids, even though this was our first meeting with Mr. Lampic. We can highly recommend this luxurious apartment for any family with children looking for a luxurious apartment in a very nice, calm and pretty village of Podgora.